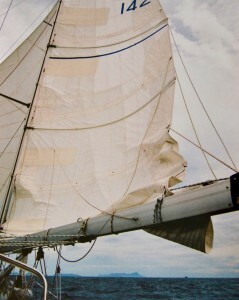 Sails are the main drivers and should be of good quality and shape to last the planned trip. Polyester is by far the most commonly used woven sailcloth under the trade name Dacron . This material provides value for money and if sourced from a reputable manufacturer lasts long. Not every Dacron cloth is the same so tell the sail maker about your cruising plans when ordering a new set of sails. To improve the lifespan of the sails put some effort in UV protection when at anchor by always putting up the sail cover on the mainsail and have a UV protection covering the leech of the headsail(s). The latest development is a painted on protection which comes with a warranty. Some cruisers prefer laminated sailcloth which has superior stretch characteristics compared to Dacron. It is in essence a sandwich combination of woven polyester with a glued in Mylar film or scrim (loosely woven fibers) to improve stability of the cloth. It is more expensive and probably shorter lived than all Dacron sails but because of its better stability appeals to cruisers with a racing back ground. Tensioning the line in the foot of a partly rolled up and boomed out genoa stops destructive flapping of the foot. Sails have a hard life and good care will be paid back in longevity. 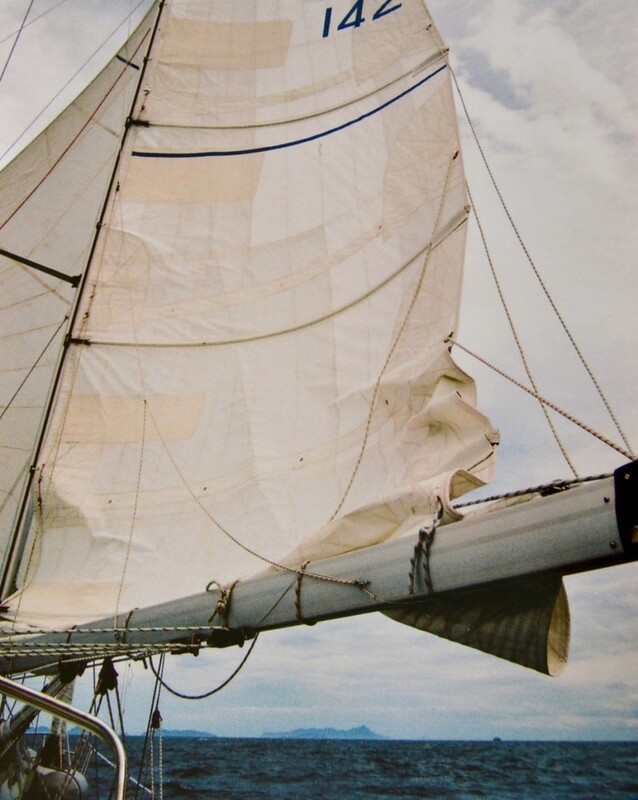 Flapping of the leech and foot of headsails and mainsail weakens the cloth as does UV. Chafe patches on all areas of contact with shrouds, spreaders or reefing lines are useful. Effective leech lines especially for a reefed mainsail or partly rolled up headsail are essential. Foot lines in the genoa would be useful as well. 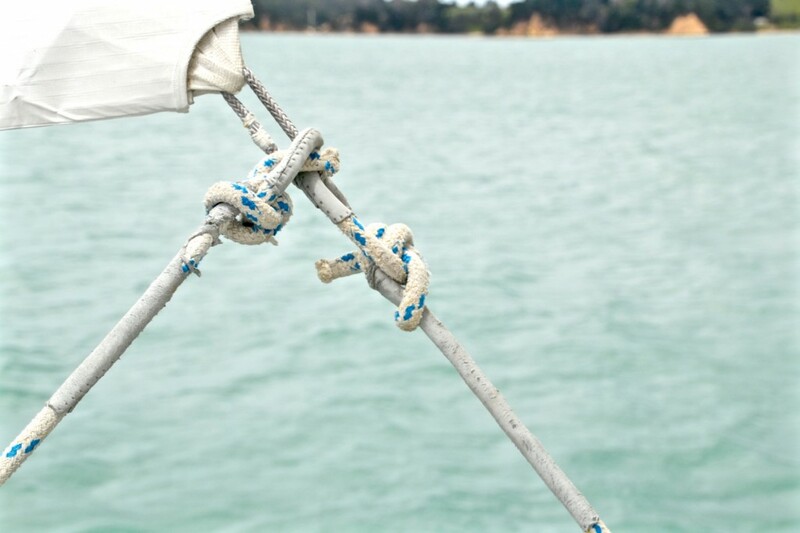 Note the wear on the lazy sheet and also the double bowline. This double knot is easier to undo after a high load than a single bowline. Not just the sails need chafe protection, also the sheets where chafe is possible. This genoa sheet is protected against chafe when boomed out on the spinnaker pole. 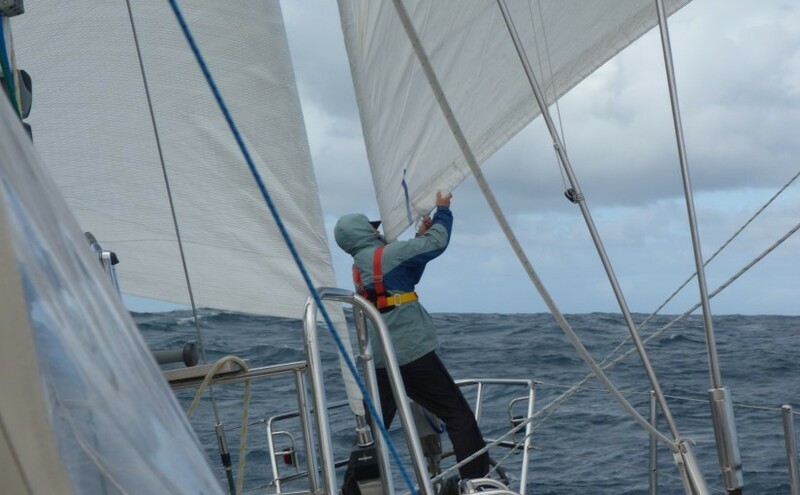 It is nearly impossible to reef an in-mast rolling or in-boom rolling mainsail when going downwind. One needs to head up to at least 70 degrees up wind upsetting the off watch crew. Early reefing before conditions get too overwhelming is essential. One does not want a stuck mainsail when condition worsen rapidly. In contrast, downwind reefing with a conventional slab reefing system, particularly with a fully battened mainsail is easily done. Even when sailing up wind one can safely reef downwind. Bear off to 120 – 150 degrees off the wind. Raise the boom to allow for the 1st reef. 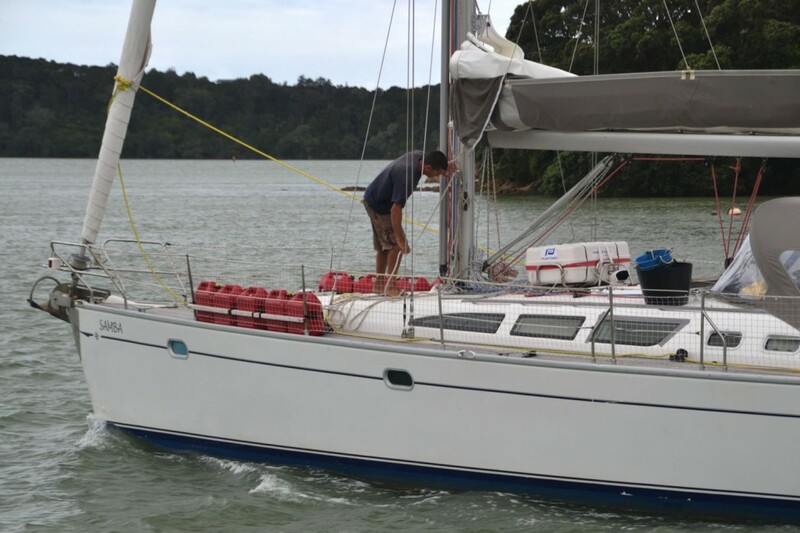 Bring the boom enough in to pull the mainsail a little distance away from the shroud particularly with back swept spreaders. 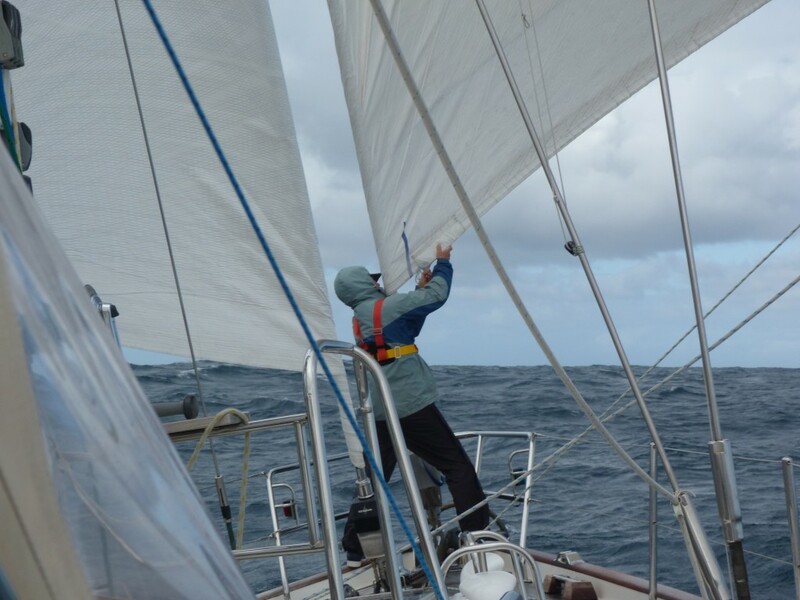 wind in the reefing line thereby pulling the mainsail again away from the shroud. 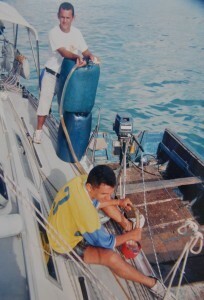 Repeat easing the halyard and pulling the reefing line till the reef is in. Attach the Cunningham down-haul to the sail and tighten. With boomed out headsail, sailing at about 120 degrees off the wind a second reef is being being put in. This can easily be be done single-handedly and without disturbing an off watch crew. As mentioned before, a fourth reef build in to replace a difficult to handle and often non-existent try-sail is worth considering. The reefing line that goes with it only to be rigged when making an offshore passage. 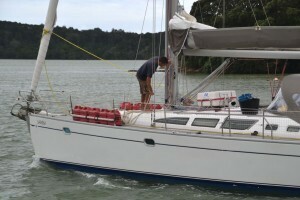 Note the fourth blue reefing line is rigged to be used as a try-sail just in case. 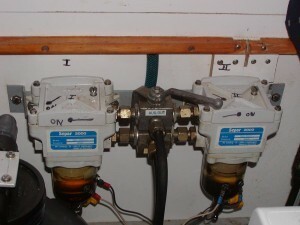 The Main Engine is the real work horse on a yacht, particularly if there is no generator on board. Not just for motoring during wind still periods but also into anchorages cirkeling around to find a safe and convenient place to anchor, then setting the anchor motoring slowly backwards or in a marina in and out of the berth. That’s the problem from the point of view of the engine. These operations take often only a short time at low revs. The engine doesn’t get warmed up enough and burns fuel inefficiently choking the inside of the cylinders and the exhaust pipes with unburned fuel and subsequent deposits. Take care of your engine by running it under a good load so that it heats up before shutting it down. Running an engine regularly under a high load, some 70% of the maximum revs, does it a lot of good. Engines come with their own dedicated alternator regulated to charge the starter battery. Always equip the main engine with a powerful second alternator regulated for and capable and regulated for charging the battery bank even if you have a generator for charging the domestic batteries because that provides a useful backup in case of generator failure. A 160 amp generator will do the charging job with ease and doesn’t get too hot in an already hot engine room. Choose the biggest one you can accommodate. Plastic fuel tanks lashed on the guard rail are a liability. If possible increase the diesel tank capacity in-board and try to avoid carrying extra diesel in tanks lashed onto the guard rails on deck. This could be a liability in serious conditions. Try to keep the internal tanks topped up. Not only is getting good fuel not everywhere possible but also to minimize condensation inside the tank. A common sight: Tanking up in the Galapagos. Not to be recommended without carefully filtering the fuel whilst tanking up. Add Biocide to fuel to minimize growth. Also in the fuel system a double filter set-up is ideal. Glass bowls and a water alarm should be standard.